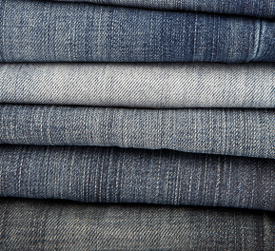 Blue jeans add green value. Made largely from recycled cotton blue jean fibers, cotton batt insulation is a worthy substitute for fiberglass batts. Other insulation has long been a symbol for affordable, reliable insulation in the form of pink fiberglass batts. But today this well-known mascot for energy efficiency is getting some serious competition from a growing variety of other materials – including batt insulation made from recycled cotton fiber. Cotton batt insulation was developed as a "green" alternative to standard fiberglass batt insulation. Instead of being made from finely spun glass, cotton batt insulation is made from cotton fiber. About 85% of the fiber comes from factory waste – blue jean and other cotton scraps that would normally go into a landfill instead of into an energy-saving product. Most fiberglass batt insulation also contains recycled content, but it’s a smaller percentage. Also, the manufacturing process for fiberglass batts is more energy intensive because of the high temperatures required to melt and spin the glass fibers. Cotton batt insulation can be installed in the same locations where fiberglass batts would be used. In thickness and width, cotton batts are sized to fit between studs, joists and rafters spaced on standard 16-in. and 24-in. centers. When odd-sized areas need to be insulated, cotton batts can be cut with a utility knife. Although cutting the cotton requires a little more effort than cutting fiberglass batts, cotton fibers don’t itch when they contact the skin or pose the same inhalation hazards as fiberglass batts do. Cotton batt and fiberglass batt insulation have similar insulating values (up to 3.9 per in. for cotton batts). During the manufacturing process, cotton batts are treated with a boron-based compound that makes the material resistant to fire, mold and insect damage. But like other fibrous insulation materials, cotton batts absorb moisture and lose insulating value when wet. They’re not well-suited for use in basements, crawl spaces and other naturally moist or humid locations. Most homes don’t have adequate insulation. As a result, homeowners end up paying much more than necessary for heating and cooling, which accounts for nearly 50% of total home energy use. When performed by an experienced contractor, basic air-sealing an insulation upgrades can cut heating and cooling costs by as much as 40%, while making your home more comfortable and healthful to boot. Contact a qualified professional to see how cotton batts and other types of insulation can make your home more energy efficient.